Hundreds of protesters are reportedly attacking the UN's headquarters in eastern Democratic Republic of Congo. A UN spokeswoman said that cars were being damaged and windows shattered in the regional capital, Goma. The protesters are angry that a 17,000-strong UN force has not better protected them against an offensive by rebel forces. Tens of thousands of people are said to be fleeing towards Goma as government troops retreat. The rebel troops are loyal to renegade general, Laurent Nkunda. UN spokeswoman Sylvie van den Wildenberg told Associated Press news agency protesters were throwing stones over the wall of the UN compound. 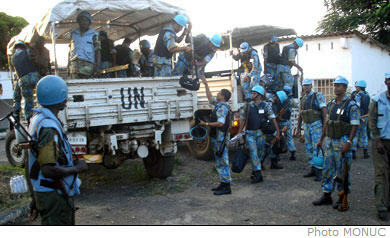 United Nations peacekeepers are now reportedly moving towards the area where fighting with the rebels is taking place. Over the weekend the rebels, who say they are protecting the area's Tutsi minority, captured a major army camp at Rumangabo and the headquarters of Virunga national park. A BBC reporter in eastern DR Congo says the main Kibumba camp for displaced people near Rumangabo has emptied, as people flee towards the city. Gen Nkunda has threatened to take control of Goma. The UN accused his soldiers of firing rockets at two UN vehicles on Sunday, injuring several troops. A Nkunda spokesman denied the rebels were involved. The UN told AP it was considering using helicopter gunships against the rebels in Rumangabo but that government troops were also in the area and could be hit. Gen Nkunda's rebels attacked Goma last December. Hundreds of them died as the UN used helicopters under its mandate to protect civilians. A peace deal was signed in Goma between the government and various rebel groups at the end of January. Although he signed the deal, Gen Nkunda has always refused to disarm while Rwandan Hutu rebels still operate in the area. About 200,000 people fled their homes after fighting resumed in the area in late August. The United Nations says many refugees are malnourished and some are dying of hunger.